Guys, we are back with Data plan posts and Nigerian Topics. Our Loyal users complained and asked why we stopped. I'll Gladly tell you we are back. Anyway, MTN has a new offer of 1.2GB for N500 Data plan which is available to all users. Here is how to activate MTN 1.2GB for 500 data plan 2018. The MTN N500 for 1.2GB can be used on All devices ranging from Android, Modems or even internet Dongles. This Mtn Data Plan lasts for 1 week, so it's still nice for users who want to use the MB for an important task. 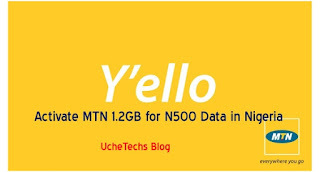 Don't forget you can still get free 500MB for N25 on Mtn. This has really been of help to bloggers, especially me. To clear some questions i will be expecting, the MTN 1.2GB for N500 is actually 1000MB (1GB) which can be used all day till the 7 days expiry period, while the remaining 200MB will be used in the Mid-Night starting from1 - 4Am for 1 week too.